This ladybird is also known as Mealybug Destroyer. This is a small ladybird beetle. 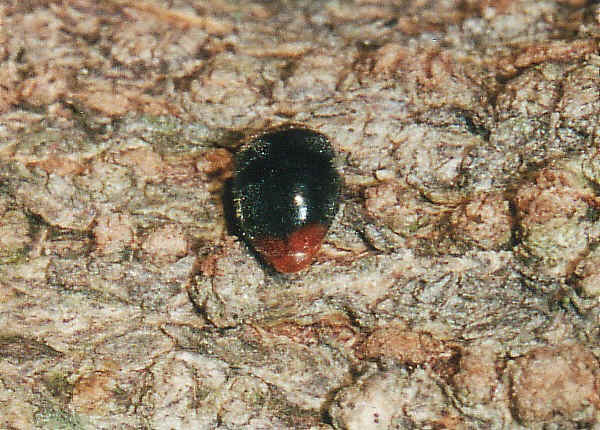 This ladybird is famous on attacking mealybug, one of the worst pest in the world. 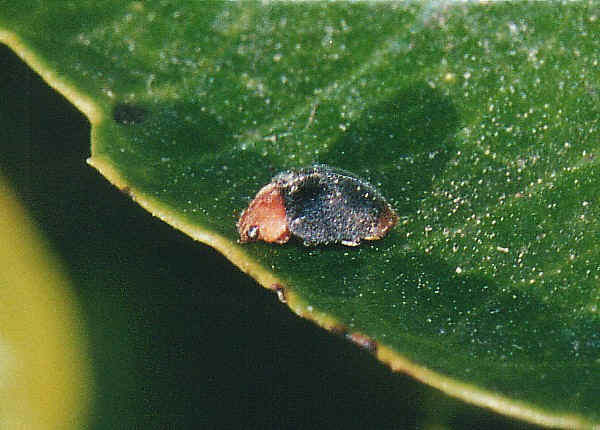 This ladybird was exported from Australia to the United States in 1891 to control citrus mealybug in California. The ladybird adults are dark green in colour, with thorax and head yellowish-brown. Their 'tails' are also brown in colour and look like their head. We expect to take a front photo, only find it is the tail after we enlarge the picture. This ladybird is shy. It is hard to take its close-up pictures. It always stays at the other side of the leaf or stem when we come close. When disturbed, it drops to the ground. A few seconds later, it flies away. In mid summer one of the Hibiscus plants in our backyard was heavily infected by the Prickly pear cochineal (Dactylopius opuntiae), as shown in the above pictures. We noticed that there were already the Mealybug Ladybirds feeding on them. 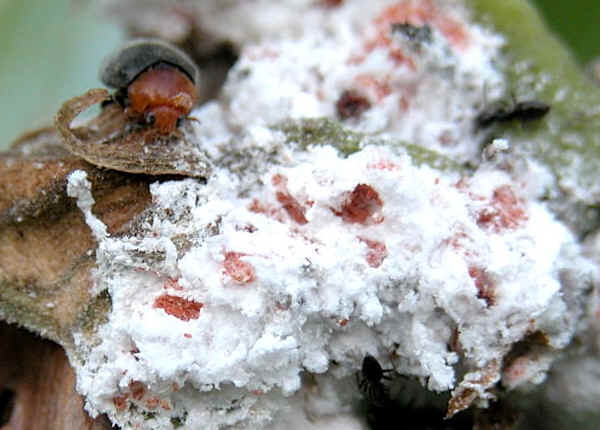 We expected the Prickly pear cochineal infection problem will be fixed very soon. Yes, few weeks later, the Prickly pear cochineal infection was down to unnoticeable level. The only white stuff on the Hibiscus were the Mealybug Ladybird larvae. 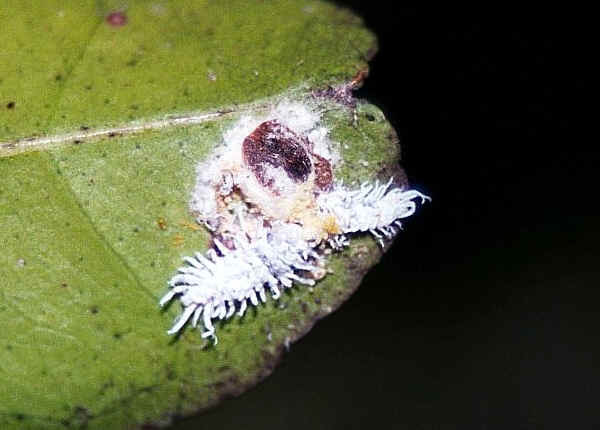 The above first picture shows two ladybird larvae feeding on the scale insect on a Citrus leaf. Mealybug Ladybird larvae, body length 4mm. The larvae of this ladybird look like their major prey - the Mealybug, although they also prey on other soft bugs. The eggs are yellow in colour.